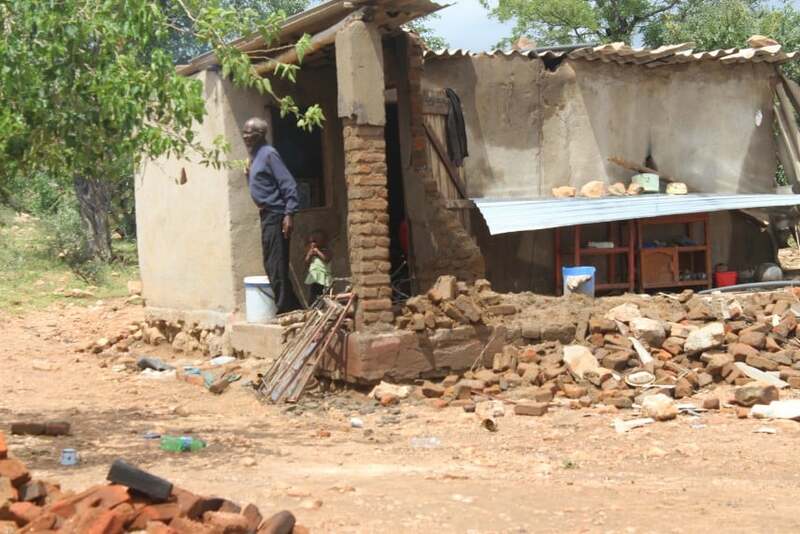 Six days after a devastating cyclone hit the Southern parts of Manicaland Province, the disaster-plagued people of Chimanimani remain cut off from the rest of the world, with food aid taking days to reach the area. There appears little organization or coordination from the powers that be. Slow response and an absent President, who only came back in the country from a state visit in the United Arab Emirates yesterday morning has hindered any meaningful progress of aid reaching the starving people in time. Estimated deaths from Cyclone Idai have risen steadily since it hit last week with government putting the figure at 98 as of yesterday evening. Shortly after the cyclone, several were feared dead, hundreds missing while others are still marooned on trees. Hundreds fled to higher ground during the flooding, perching atop churches and on trees to avoid being swept away. However, roads remain blocked by debris, forcing aid workers to take long to inspect damage to houses, schools and other buildings. Given poor communications and the remote location of many affected areas, Cyclone Ida’s destruction cannot yet be fully tallied. But this publication can report scenes of devastation, with crops, livestock, roads and bridges destroyed. There are also reports of people still stranded in outlying areas of Chimanimani waiting to be rescued. Communications to Mutare, the closest city to Chimanimani, remain cut as major roads have become extremely impassable. The cyclone flattened most homes and toppled brick walls. Several hundreds of people have no maize-meal, drinking water or medicine. Indeed, Zimbabwe’s emergency relief effort remained pitifully inadequate on Monday as thousands of storm survivors struggled to starve off hunger and impending water-borne diseases. Only a trickle of supplies needed to prevent hundreds of deaths is reaching the worst-hit southern part of the province. The crisis appears far beyond the impoverished country’s limited resources. The air force is reportedly flying two helicopters to deliver supplies to thousands of far-flung villages devastated by the storm’s fury. Food reserves in many villages were already low, waiting for the impending harvest. The El Nino induced drought ruined the cropping season and the cyclone washed the standing crops while damaging the fields, potentially for months to come. “The cyclone could not have happened at a worse time,” said Robin Mutingwende, a subsistence farmer in the area. “Everyone in Chimanimani really lives subsistence lives, so they grow what they need for a short period. … And the reality is that much of that would have been washed away by this storm,” said Daniel Muyambo, chairperson of the Disaster Management Committee in the area. “That’s a grave concern because we desperately need to get food to people soon,” he said. Meanwhile, the government has availed $50 million towards the relief of the affected. The UN has since dispatched a team of 22 UN personnel to areas most affected by the cyclone. Sirak Gebrehiwot from the U.N said the team will join members of the Department of Civil Protection (DCP), local Government and other implementing partners to conduct a needs assessment, which will give insights into the kind of emergency relief needed. International Organisation for Migration (IOM) had so far distributed 1 000 tents to support affected populations who were left homeless in the aftermath of Cyclone Idai in Chimanimani, Mutasa, Nyanga and Chipinge districts.